Late last year, I found myself walking across the lonely grounds of the Chicago Botanic Garden during the first snow of winter. 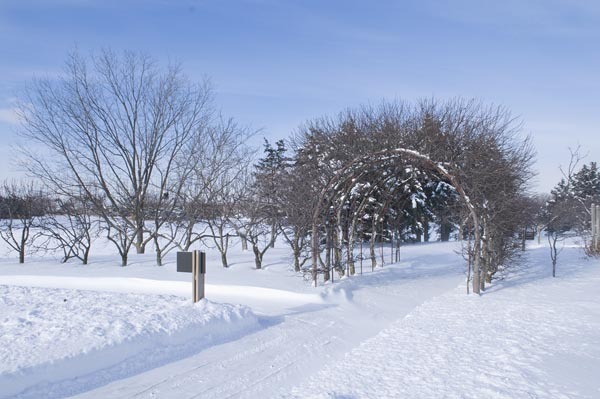 Snowflakes were beginning to drift down and gently cover manicured beds of grass and dirt as I made my way over bridges and through arbors toward my goal: a 3.8-acre island in the northwest corner of the property known as the Regenstein Fruit and Vegetable Garden. Having recently embarked upon my own urban gardening adventure, I had decided that it was time to draw from an outside, knowledgeable source, and the Garden’s food-related exhibits seemed to provide the inspiration I sought. I hoped to pick up some tips and techniques, and learn from the staff’s ability to grow and maintain edible plants. I arranged to meet a guide, who would show me around and help me get the most out of my visit. And although the crisp air and swirling snowflakes made me wonder why I hadn’t just sensibly arranged a phone interview, I wasn’t totally alone. Hardy geese skated across the icy lagoon, and garden workers were busy arranging tiny colored lights on the great evergreen tree that had been erected at the end of the esplanade. 2013 was the first year that the Chicago Botanic Garden saw one million visitors, although I didn’t see any of them that day. This sprawling site is composed of 385 acres on Lake Cook Road, just off the Edens Expressway in Glencoe. It has become a jewel among the metropolitan area’s many cultural resources. Owned by the Cook County Forest Preserve District, open to the public since 1972, and supported financially by 50,000 members (the largest membership of any public garden in the United States), it features 25 display gardens that focus on a wide range of themes. My personal favorites include the walled English garden, the stunning bonsai collection, and the three Malott Japanese Garden islands. But I wasn’t here for these. 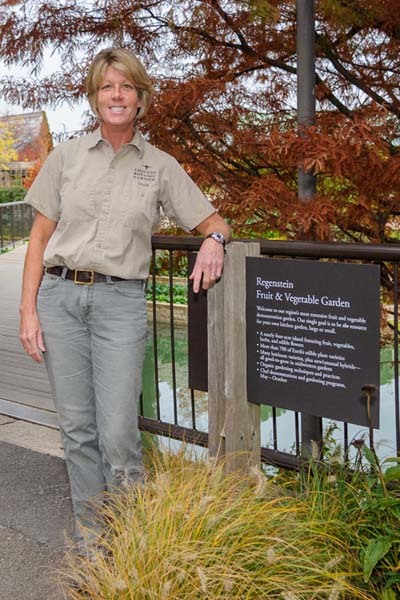 Lisa Hilgenberg, the Regenstein Fruit and Vegetable Garden’s lead horticulturalist since 2010, met me near her office in the middle of the fruit and vegetable garden’s island. An energetic woman with short sandy hair, a strong handshake, and a quick smile, she waved me in. I pulled out one of my ears of Glass Gem corn, which I’d brought for her as a token of my gratitude. She immediately recognized it, and seemed delighted at the offering. 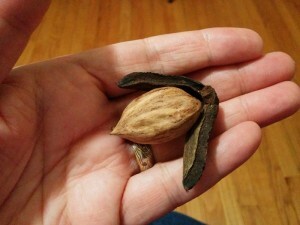 Then she picked up a mottled pecan with a curled brown husk from her desk. “I found this on my walk this morning; here, you can take it with you,” she said to me.